Have you applied for NDA & NA examination II 2013 and looking for admit card? UPSC is now issuing e admit card for written exam of NDA & NA. Check out the procedure of downloading e-admit card of NDA & NA examination here. NDA & NA examination is the gateway to become an officer in Indian Armed Forces. Union Public Service Commission of India has released notification of NDA & NA exam II 2013 on 04th May 2013. Through the notification, UPSC has invited applications from young and dynamic men for officer posts in Indian Army, Air Force and Navy. Lakhs of students have applied for the examination through online registration. After preliminary inspection of applications, UPSC has released fictitious cases of non receipt of fees of NDA & NA exam II 2013. Candidates had one final chance to challenge UPSC and provide the proof of fees submission within ten days. After checking all cases, UPSC is issuing admit cards for NDA & NA exam II 2013 for all candidates who have filled up the forms correctly. In order to download the e admit card of NDA & NA exam, please follow the below simple steps. First of all go to UPSC's official website i.e., www.upsc.gov.in. In the home page, you will see "e-Admit Card - NDA & NA (II) Exam 2013" link in the left hand side. After clicking the link, you will be redirected to admit card website of UPSC. There you can see a link to download NDA & NA exam II 2013. Click on "Click here" link beside NDA & NA exam II 2013. Fill up the details required for generating e admit card of examination. Required fields are Registration ID, date of birth and candidate need to enter image verification code. Finally click on "Submit" link. 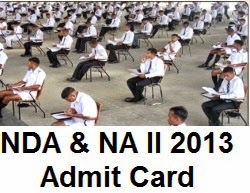 Your e admit card of NDA & NA examination II 2013 will be generated. Take a print out and prepare well for the examination by referring previous question papers of NDA & NA exam.